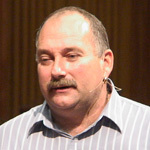 Ian Clayton, while native to South Africa, currently lives with his family in New Zealand. As you will find in listening to Ian, he has a passion for walking and functioning in all aspects of the realm of the Kingdom of God. His ability and persistence in connection with the spirit of God is infectious. His drive to grasp the Kingdom principles and the complete inheritance promised to a child of God, to walk with God, produces a powerful ministry of prophetic insight, teaching and practical application. Ian has travelled to Asia, Canada, US, Australia, Namibia and South Africa to teach the principles God has shown him. IC09-D2 $10 2a. "The Human Mind"
IC09-D3 $10 "Speed Of Light"